60 D I V E R S I T Y W O M A N Fa l l 2 0 1 7 d i v e r s i t y w o m a n . c o m e Mt Powerl Women inCorporateAmerica * Information not found on company website; Bloomberg used instead. ** Information not found on company website; Wall Street Journal used instead. Naomi B. Kinderman, Assistant Vice President and Counsel Nancy Micale, Assistant Vice Presi- dent, Human Resources Suzette A. Lemson, Assistant Vice President, Office of the Chairman Laura A. Stevens, Assistant Vice President, Corporate Actuary Beth Z. Green, Director of Claims Litigation Management Janet L. Shemanske, Assistant Secretary Donna Syko, Assistant Secretary, Human Resources 355. Quanta Servic 356. EOG Rourc Ann D. Janssen, Vice President, Accounting Jill R. Miller, Vice President, Engi- neering and Acquisitions Patricia L. Edwards, Senior Vice President and Chief Human Re- sources Officer 357. Charl Schwab Catherine Casey, Executive Vice President, Human Resources Marie Chandoha, President and Chief Executive Officer, Charles Schwab Investment Management Inc. Neesha Hathi, Executive Vice President, Investor Services, Client Experience and Platforms Lisa Kidd Hunt, Executive Vice President, International Services and Special Business Development Terri R. Kallsen, Executive Vice President, Investor Services 358. Eversource Energy** Christine M. Carmody, Executive Vice President, Human Resources and Information Technology Barbara F. Neiman, Investor Rela- tions Contact Caroline Pretyman, Media Contact 359. Anter International 360. EMCOR Group Maxine Lum Mauricio, Senior Vice President and General Counsel Lisa Haight, Vice President, Human Resources Mava K. Heffler, Vice President, Marketing and Communications 361. Assurant Francesca Luthi, Executive Vice President and Chief Communication and Marketing Officer Robyn Price Stonehill, Executive Vice President and Chief Human Resources Officer 362. CenterPoint Energy Dana O' Brien, Senior Vice President, General Counsel, and Corporate Secretary Sue Ortenstone , Senior Vice Presi- dent and Chief Human Resources Officer 363. Harr Tania Hanna, Vice President, Gov- ernment Relations 364. HD Supply Holdings Anna Stevens, Vice President, Hu- man Resources, and Chief People Officer 365. PPL Joanne H. Raphael, Senior Vice President, General Counsel, and Corporate Secretary 366. Qut Diagntics Catherine T. Doherty, Senior Vice President and Group Executive, Clinical Franchise Solutions and Marketing Carrie Eglinton Manner, Senior Vice President, Advanced Diagnostics Lidia Fonseca, Senior Vice President and Chief Information Officer 367. 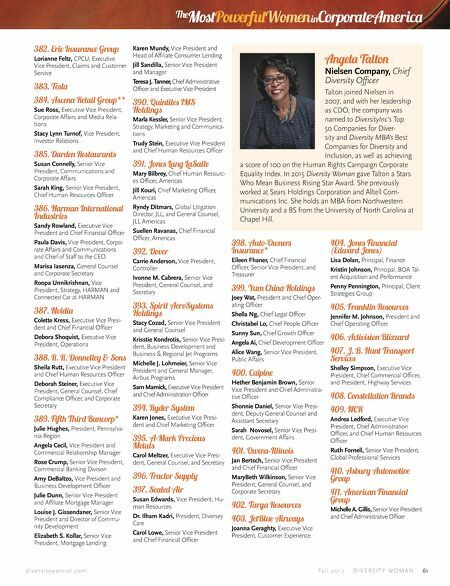 Williams Robyn L. Ewing, Senior Vice Presi- dent and Chief Administrative Officer 368. WEC Energy Group Heidi Humbert, Vice President and Chief Audit Officer Susan H. Martin, Executive Vice President, General Counsel, and Corporate Secretary Joan M. Shafer, Executive Vice President, Human Resources, and Organizational Effectiveness Compli- ance Officer M. Beth Straka, Senior Vice Presi- dent, Corporate Communications and Investor Relations 369. e Hershey Company Michele Buck, President and Chief Executive Officer Patricia Little, Senior Vice President and Chief Financial Officer Leslie M. Turner, Senior Vice President, General Counsel, and Corporate Secretary Mary Beth West, Senior Vice Presi- dent and Chief Growth Officer 370. 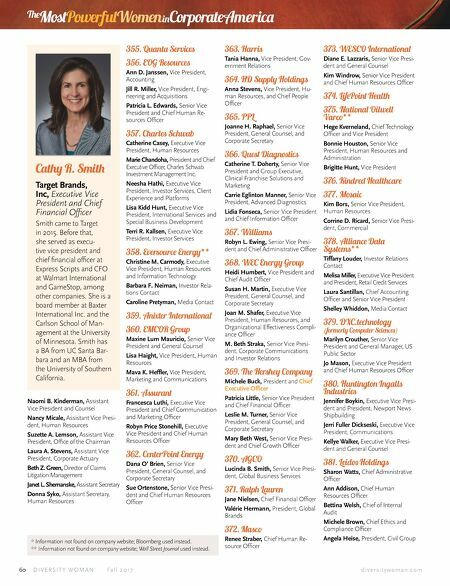 AGCO Lucinda B. Smith, Senior Vice Presi- dent, Global Business Services 371. Ralph Lauren Jane Nielsen, Chief Financial Officer Valérie Hermann, President, Global Brands 372. Mco Renee Straber, Chief Human Re- source Officer 373. WESCO International Diane E. Lazzaris, Senior Vice Presi- dent and General Counsel Kim Windrow, Senior Vice President and Chief Human Resources Officer 374. LifePoint Health 375. National Oilwell Varco** Hege Kverneland, Chief Technology Officer and Vice President Bonnie Houston, Senior Vice President, Human Resources and Administration Brigitte Hunt, Vice President 376. Kindred Healthcare 377. Maic Kim Bors, Senior Vice President, Human Resources Corrine D. Ricard, Senior Vice Presi- dent, Commercial 378. Alliance Data Systems** Tiffany Louder, Investor Relations Contact Melisa Miller, Executive Vice President and President, Retail Credit Services Laura Santillan, Chief Accounting Officer and Senior Vice President Shelley Whiddon, Media Contact 379. DXC.technology (formerly Computer Scienc) Marilyn Crouther, Senior Vice President and General Manager, US Public Sector Jo Mason, Executive Vice President and Chief Human Resources Officer 380. Huntington Ingalls Industri Jennifer Boykin, Executive Vice Presi- dent and President, Newport News Shipbuilding Jerri Fuller Dickseski, Executive Vice President, Communications Kellye Walker, Executive Vice Presi- dent and General Counsel 381. Leid Holdings Sharon Watts, Chief Administrative Officer Ann Addison, Chief Human Resources Officer Bettina Welsh, Chief of Internal Audit Michele Brown, Chief Ethics and Compliance Officer Angela Heise, President, Civil Group Cathy R. Smith Target Brands, Inc, Executive Vice President and Chief Financial Officer Smith came to Target in 2015. Before that, she served as execu- tive vice president and chief financial officer at Express Scripts and CFO at Walmart International and GameStop, among other companies. She is a board member at Baxter International Inc. and the Carlson School of Man- agement at the University of Minnesota. Smith has a BA from UC Santa Bar- bara and an MBA from the University of Southern California.